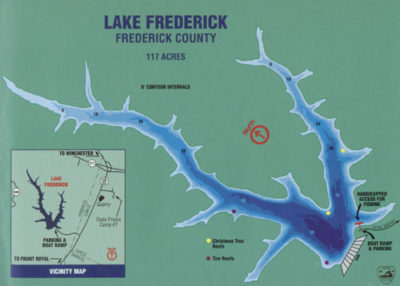 Lake Frederick is a 117-acre impoundment owned by the Virginia Department of Game and Inland Fisheries. The department acquired the lake and a fifty foot buffer around the entire shoreline in 1981. Lake Frederick remains clear throughout the year and stratifies forming a thermocline during the summer months. The lake has a maximum depth of 50 feet and an average depth of 20 feet. Much of the shoreline and the upper ends of the two embayments contain standing submerged timber. Typically, the standing timber is located along the shoreline out to around twenty-five feet from the water’s edge. There is adequate bank fishing access along the breast of the dam and around the lower end of the lake. Boat anglers are welcome, but gasoline motors are prohibited. Only electric trolling motors are allowed. Some of the fish species that anglers might encounter while fishing Lake Frederick include: largemouth bass, bluegill, redear sunfish, black crappie, channel catfish, and northern pike. VDGIF annually stocks channel catfish, and northern pike. The rest of the fish species in Lake Frederick reproduce naturally. The largemouth bass population is excellent with many fish in the 2-4 pound range available to anglers. Lake Frederick has historically produced the best quality largemouth bass fishery in the Shenandoah Valley. Anglers have wrestled largemouths up to 10 pounds from the lake in recent years. Some of these trophy bass have also been released back to fight another day. Reproduction appears to be very stable, and good numbers of bass 12-18″ representing the bulk of the fishery. ** Compared to bass from more southern latitudes, largemouth in Lake Frederick exhibit slow growth rates. It takes around 6 growing seasons for a bass to reach 14″ in Lake Frederick. The primary forage for largemouth bass are numerous small bluegill and black crappie. The fact that Frederick produces bass up to 10 lbs is proof that a pelagic forage species need not be present to grow large fish. The clear water of Lake Frederick often makes it difficult to catch bass. Bass often become suspended in the submerged standing timber that surrounds much of the shoreline. Anglers need to fish different depths until they locate fish. Night fishing during the summer months can also be productive. Some of the largest bass are caught during the pre-spawn in the months of March and April. The quality largemouth bass population is beneficial to the sunfish population. By preying upon small sunfish and keeping their numbers low, bass help to produce “hand-sized” bluegill and redear sunfish. 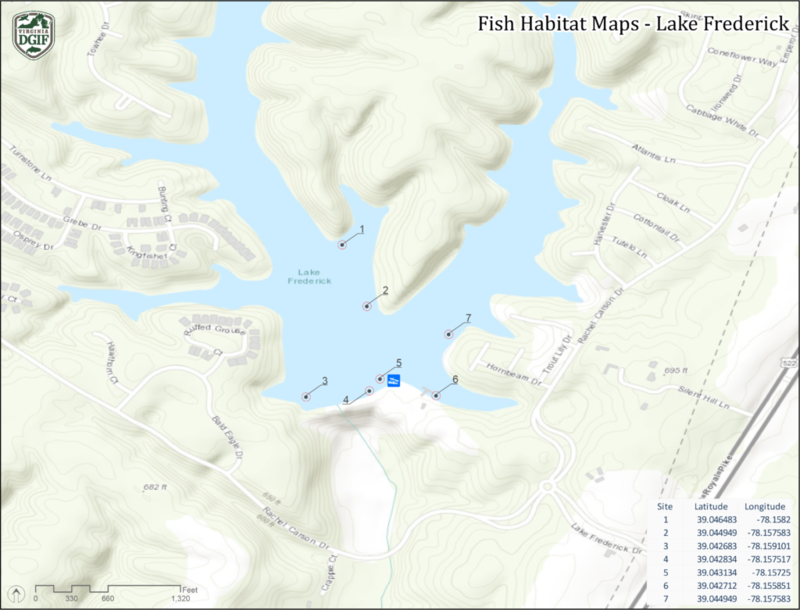 If you are looking to catch a “citation” sized sunfish then head to Lake Frederick. It is the only lake in the region that produces good numbers of large sunfish. Anglers have been successful using live bait such as crickets and red worms to catch these “whopper” panfish. We have not done any specific sampling targeting crappie in recent years, but the population appears to be healthy. Crappie numbers are stable and fish of harvestable size (8-10″) are available to anglers. Anglers should focus on the breast of the dam and around the fishing pier in the spring when water temperatures reach the mid 50’s. Live minnows and small jigs should be the best baits. Channel catfish are stocked annually be the Department. Some bruisers up to 30lbs have been taken from Lake Frederick in recent years. Catfish anglers should use cut bait, nightcrawlers, or commercial catfish baits to entice these “whisker fish”. No bass between 12-18 inches can be harvested. Only one bass longer than 18 inches may be harvested. 50 sunfish per day (all species in aggregate). Only northern pike longer than 20 inches can be harvested. Prohibited:Gasoline motors, swimming, ice skating, hunting, trapping, camping, organized fishing tournaments, and alcoholic beverages. Fishing is permitted 24-hours a day unless otherwise posted. All other activities shall be conducted only during daylight hours. Fishing regulations shall conform to general statewide regulations unless otherwise posted. Lake Frederick has a paved entrance road, gravel parking lot, paved boat launch with courtesy dock, and a handicapped accessible fishing pier. Gregory’s Lakeside Bait and Tackle is located at the Lake Frederick VDGIF boat ramp and parking area. To see fish being caught at the lake and for more information on Gregory’s Lakeside Bait and Tackle visit their Facebook page.